아이들에게 있어 창의적인 생각은 그들의 생활 속 경험으로부터 시작됩니다. 집을 오가며 접하는 자연은 물론이고 매일 사용하는 일상생활용품까지, 그들이 겪는 세상의 모든 것들은 호기심의 대상이자 창조적 사고의 근간을 이루는 모티프라고 할 수 있습니다. 물론 아직은 확고한 의식이나 관념이 형성되지 않았기에 이토록 강한 관심을 불러 일으키는 것이겠지요. 하지만 바로 이 부분이 어른과 아이의 차이점이자 기성작가의 시각과도 확연히 구분되는, 그들만의 무한한 상상력을 유발시키는 근원이자 창작의 원천이라 할 수 있을 것입니다. 어찌 보면 시계추처럼 평범한 일상, 지극히 사소한 사물일 뿐이지만 그럼에도 그들은 그 속에서 자신이 의도하는 본질을 추구하며 끊임없이 재해석하고 새로운 의미를 부여해 나갑니다. 하지만 아직은 스스로 사물의 의미를 확장시키고 새로운 존재로 탄생시키는 창조적 사고 과정에 익숙하지 않은 것이 또한 아이들이죠. 바로 여기서 선생님의 역할이 필요합니다. 그들과 똑 같은 눈높이로 경험을 함께 나누며 창의적 생각이 발전될 수 있도록 지속적인 기회를 제공해줘야 합니다. 이러한 관점에서 아이들의 창작활동은 일상의 것들을 새로운 시각으로관찰하여 자신만의 의미를 창조하고 특유의 조형언어로 표현함으로써 더 넓은 상상의 나래를 펼쳐나갈 수 있도록 하기 위한 교육과정입니다. 예술은 단지 손으로 만드는 것이 아니라 예술가가 경험한 감정의 전달이라는 톨스토이의 말처럼 소위 그림을 잘 그리는 것은 단순한 묘사 기능에 불과합니다. 그보다는 자신의 경험과 감정을 미술로 표현하는 과정을 통해 창의력 개발과 미학적 안목을 키워주는 것이 무엇보다 선행되어야 할 사항입니다. 이것이 바로 현대 미술교육의 첫 단추라고 할 수 있겠지요. 하지만 생각의 발전과정이 중요한 만큼 평생 남을 결과물과 전시 행위 또한 매우 중요합니다. 이번 전시는 아이들의 창의적 생각이 어떻게 발전하여 창조적으로 표현되었는지 그 과정을 기록한 프로젝트 전시라고 할 수 있습니다. 실제 자신만의 이야기를 바탕으로 전개되는 지앤키즈 아이들의 순수한 미술작품전인 셈이죠. 그 중에는 폭소를 터뜨리게 하는 기상천외한 상상력의 재미있는 작품들도 있고 현역에서 활동하는 기성의 전문작가들도 믿기 어려울 만큼 놀라운 조형성과 예술성이 돋보이는 수작들도 있습니다. 아는 만큼 보이는 것이 작품입니다. 어린이 작품이라고 가볍게 보아서는 안되겠지요. 드넓은 세상을 향해 호기심으로 가득 찬 눈빛으로 반짝이는 아이들의 일상으로 당신을 초대합니다. Thus, children re-interpret and create new definitions of their experiences and goods, even it is extremely normal. However, as they are not familiar with the process of creative thinking in terms of establishing new existence, teacher should provide chances continuously to children to express and develop their creative thoughts by sharing experiences from their points of view. Therefore, creative activity is a crucial education to expand imagination by observing their life in a new way, inventing their own meaning and expressing with unique visual language. Children’s creative thoughts are based on their daily lives and experiences. Everything of the world that they encounter in their normal lives such as nature, daily supplies is subject of the curiosity and motivation of the creative thinking. It can be presumed that their intense curiosities are because of the relatively unsettled idea and concept compare with adults. This is the remarkable difference between children and adults, and it is motivation of imagination and source of inspiration. As can be read from Leo Tolstoy’s quotation; “Art is not only made by hand but also expression of artist’s experience”, so-called well painted worksmean just good skills. However, rather than just learn drawing and painting techniques, developing creativity and artistic view should be precededthrough representing their experiences and emotions with art. This is the contemporary art education’s initial purpose. However, the final artwork and exhibition which show the result how children develop and express their imaginations are also important. Accordingly, this exhibition presents the process of how children’s creative thoughts are developed and expressed. It is composed with the pure art works that are based on true stories of Zien kids. There are some extraordinary artworks that have exceptional ideas, artistic value and formativeness, even well-known artists are surprised.Therefore, children’s artworks should not be disregarded. 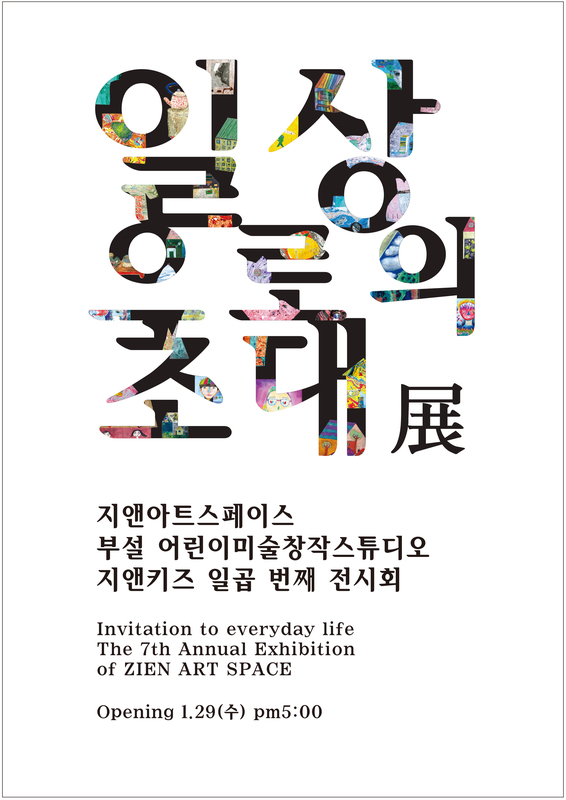 Zien Art Space invites you to children’s everyday lives that are full of curiosity to the world.